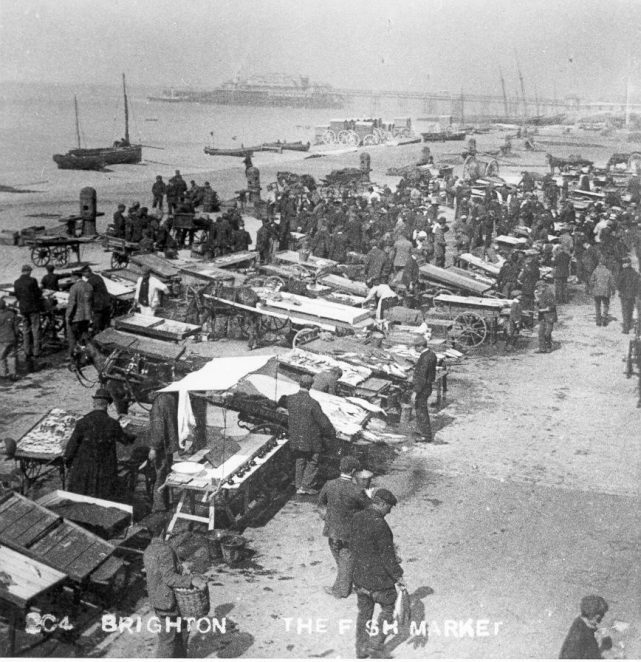 Brighton Fish Market, 1899: For many centuries, Brighton's fish market was situated on the beach below the low cliffs at the end of East Street, now built over by Grand Junction Road. From the 1880s the fish market at Brighton beach was at 216-224 King's Road Arches, with a hard area provided in front for stalls. Although fishing decreased during the 20th century, the market still sold "imported" fish wholesale until 1960, when it was removed to a new extension of the Circus Street Municipal Market. The fish market of the day never sold imported fish. When local supplies were unavailable we relied in suppliers from around the UK , Grimsby , Hull , Lowestoft etc. The fish market was moved to Circus St because certain councillors wanted to copy Hove and have gardens there instead. When the Duke of Norfolk opened the new fish market he said that a fish market belonged on the beach and not in the centre of Brighton!